The additional cost will be the freight to get them here. I have asked his plan for shipping. As a payment plan we can use PayPal for the protection. Keep me informed as I can help if needed. Does this include any inner tubes? he says he has new tubes that are old. He will send them with the tires. > The additional cost will be the freight to get them here. > I have asked his plan for shipping. > As a payment plan we can use PayPal for the protection. Tires to be shipped Monday/Tuesday from CZ. They are shipping to Colorado.Those wanting tires will need to let me know asap. First come first serve. 12 tires, 6 sets. I’m keeping 2 sets. To be fair, those that originally wanted tires can have 2 sets each. It costs me $2100 for tires and shipping. 2100/12 = $175 each + freight to you. You will need to get the freight price from zip code 81252, Westcliffe, Co. to your address. No guarantees come with this. They ship what they ship. Good or Bad. He is shipping in packs of 4 FedEx. I won’t unwrap them. I will just change the shipping label and send them to you. Unless you want one set. Send money. First money wins. Here is part of my paypal receipt. Hello, William Geipel You sent $2,100.00 USD to Letecké práce Petr Navratil s.r.o. I'll take a set, I'll send the check in the AM and provide my FedEx # for shipping. Hello, William Geipel � You sent $2,100.00�USD to Letecké práce Petr Navratil s.r.o. Tires has been sent already to Bill, should come this Friday. Just note that tubes are very old, has been included free with tires. I will not take any warranty on these tubes. If there are any left I will take a set. Sorry I haven’t called back yet. Leaving Korea in the morning. (Wednesday Korea)Tires were shipped from Czech Monday. I will definitely have 1 set. Maybe 2. I’ll let you know. Also will call when I land in LAX if I’m awake. From my experience: Old stock tires crack on the sides in 3-6 months of installation. Copy this full link and put in new window to see 600X180 tire price. I have these tires on my airplane. No problems whatsoever. The only thing is the Desser does not have the inner tubes for our airplanes. Do anybody know anyone who makes them new? 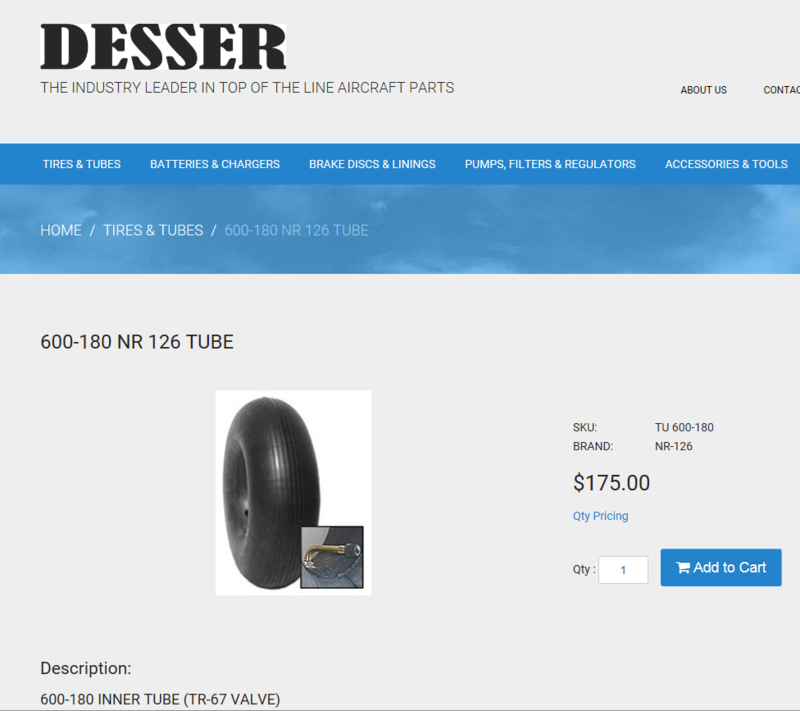 the Desser does do the inner tubes for 600x180. You will see bellow a pics when on Desser web site. The price is $175. Has anyone used these inner tubes out there on our airplanes? I looked at these before but my concern was the stem. It did not seem to be long enough to fit our wheels. Good day Gents, Ive been offline for some time and may have missed this Tyre opportunity, is there still an option to buy a set of mains please?